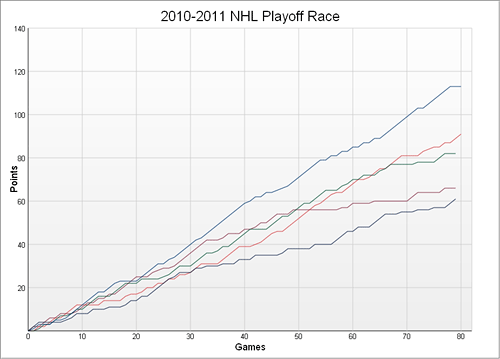 Here's a little HTML5 web application which uses the <canvas> element to help visualise this season's 2010-2011 NHL playoff race. the hardest part was actually finding the data to use. The actual canvas implementation only took an hour or so to framework, and a couple hours more to tweak and flesh out. You can dynamically select which team lines to show, as well as groups of lines based on division or conference. The X-axis can also be switched between game-by-game progression, and day-by-day. Showing the day-by-day chart allows you to see how the Christmas break and the All-Star break affected point progression during the season. You can spot some interesting trends using this tool. For instance, the race in the Northwest has been wide open, while that in the Pacific has been unbelievably tight all season long. Ottawa hit a slump between the 40 and 55 game mark but have been pretty consistent both before and after. The New Jersey implosion and second-half comeback is also visible in dramatic detail. It's a shame they fell short of the playoffs; it would have made a great story. Too bad Hollywood has no idea what hockey is.